Elan Yachts build high-performance, competitive racing sailboats for private ownership. Designed from the same DNA as the competitive models, Elan Yachts combines luxurious accommodations and options for the owner/operator to sail recreationally. 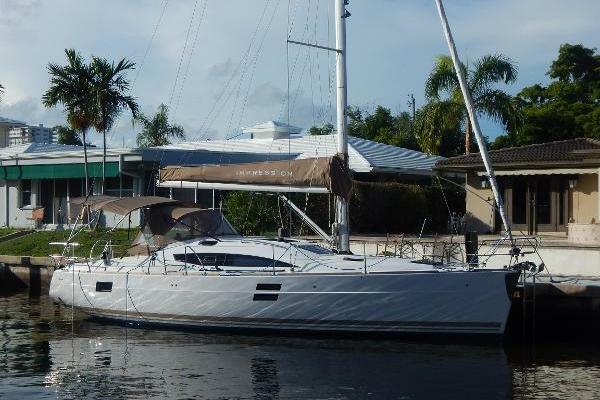 Let the team at United help you find the perfect used Elan Yacht for sale. In 1949, Elan’s boat building tradition started off with kayaks, canoes and small boat productions made up of waterproof wooden slabs. In the 1950’s is when a large number of small crafts started to be exported to the United States. Another ten years after that, in the 1960’s, announced the dawn of reinforced polyester, a revolutionary material that Elan used for racing kayaks and boats. The 1980’s was a significant decade that shifted towards the production of larger cruiser-racer sailing yachts that were design by the now, J & J Design Studio, which included the legendary Elan 31. The year 1995, Elan commenced cooperation with a renowned nautical designer, Rob Humphreys, resulting in many successful, award-winning projects. Shortly after, in 2011, Elan launched the revolutionary Volvo Ocean Race inspired by the Elan 350 with characteristic chines and twin rudders which won another European Yacht of the Year title! Elan Yachts has an eye for building rich tradition, combined with an innovative present, and holding down a strong foundation for the future of Elan Yachts. With an overall length of 34 feet and 9 inches, this sailing yacht is quiet the eye catcher. 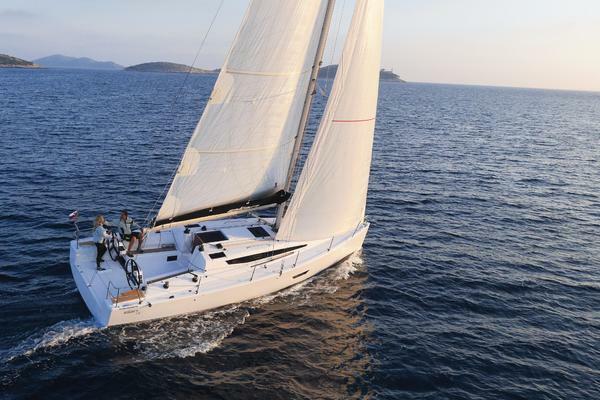 Elan E4 was developed to satisfy diverse models of sailing, from short-handed crews to family cruising, this sailing yacht was built for it all. Arranged winches, a genoa furling system and a keel stepped mast are all included in the standard package of the E4, making it a truly ultimate yacht for sailing. After sailing away, there is more than enough space above and below deck to accommodate family and friends. The Elan’s E4 has a wide beam, offering a comfortable cabin layout. There is a fully equipped galley and the navigation station on the starboard side offers plenty of space for planning where to go next as well as navigating to get there. The practical LED lighting systems compliment the beautiful woodworking’s of the natural oak furniture. The three cabin layout offers an additional aft cabin, accommodating even more crew if needed. You can’t go wrong with an Elan E4. An impressively fast cruiser is the perfect description for the Elan Impression 40. Everything about this sailing yacht and aboard it has been well thought out to ensure a pleasurable experience no matter where the destination may be. The cockpit is spacious enough for all family and friends, with sitting areas that provide the ultimate comfort. There is a twin steering wheel arrangement that offers an ideal position for the helmsman while the wide transom and bathing platform ensure easy access to the sea. There is also an option of the large platform being able to enclose to the cockpit while sailing the seas. As for the interior, it is greatly spacious with an airy feel. The amount of natural light that flows within is extraordinary. The contemporary design aboard the Impression 40, offers the utmost quality and comfort that has been superior to her class. There is a large settee in the saloon with a generous L-shaped galley to satisfy even the most demanding chef. All accommodations aboard the Impression 40 is exceptionally comfortable and tremendously spacious for being a total length of 39 feet. A total of 43 feet 4 inches sails along the open ocean so gracefully. A clean deck design ensures for fast and safe passage way and enables plenty of sunbathing area with cushions on the foredeck. There is also a swim platform with an optional cockpit galley featuring a fridge, grill and a few other amenities to enjoy with family and friends. Below deck, it is a unique space. The layout is inverted, ensuring optimal utilization of the yachts volume and space for the most comfortable and innovative saloon, and rest of the sailing yacht. There is a 180 degree panoramic skylight with the window in window feature. This new sailing yacht, GT5, is also the only yacht of Elans that offer a separate shower compartment with a three cabin, two head layout. You won’t be disappointed when stepping onto this glamourous yacht. If you’re interested in purchasing an Elan Yacht, a United Yachts Sales professional can assist you in your search. Being a 100-percent customer-driven business, United Yachts delivers every time by listening closely to your needs and budget, thoroughly reviewing the available options on the market, and taking the guess-work out of your boat search. Using a United broker to help you find the right boat or yacht for you can save you time, money, and a lot of extra work after the sale. And best of all, it costs you nothing. United Yachts Sales has experience and the product knowledge to sell your Elan Yacht. Selecting the right full-service brokerage firm when selling your yacht improves the likelihood of a seamless and timely transaction. Listing your yacht with United Yachts, you can be certain it is in the hands of dedicated professionals. With over 15 years in business, our devoted Sales Professionals work attentively to provide you with first-class representation. Our industry-leading support team includes a listing team, marketing team, and closing team with decades of combined experience to make ensure the sale of your boat or yacht goes as smoothly as possible.